Search.hyourweatherinfonow.com is the PUP that uses misleading techniques to prevent removal. Use Reimage to locate malicious components and get rid of them faster than with uninstall instructions. A full system scan blocks virus reappearance and prevents traffic to malicious domains. 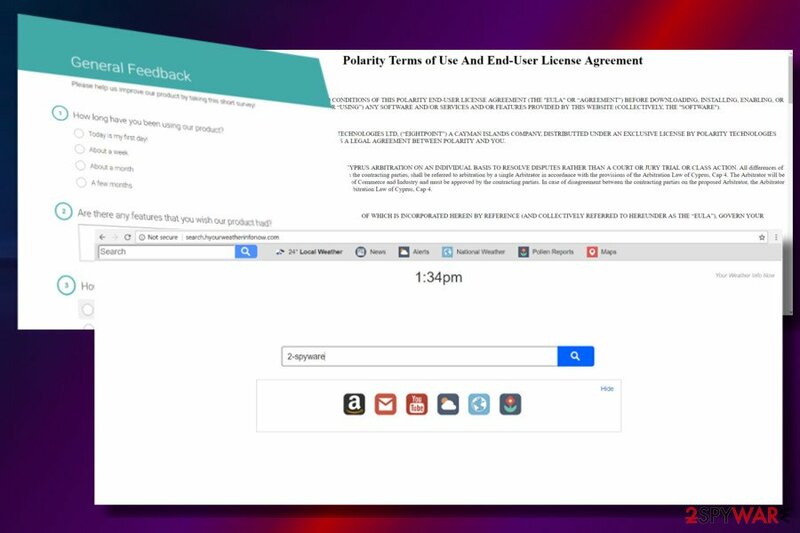 Search.hyourweatherinfonow.com is a search site developed and maintained by Polarity Technologies Ltd. – the company that is infamous for the distribution of browser hijackers. Usually, this domain pops up as a default search engine, start page, and new tab URL automatically after the PC's owner installs a particular free application to the system. More often than not, Your Weather Info Now toolbar is installed alongside these modifications. Such modifications happen due to one simple reason – Search.hyourweatherinfonow.com virus is yet another browser hijacker, which is used for affiliate marketing. Its developers shove the http://Search.hyourweatherinfonow.com search engine to display Yahoo-based search results that may be filled with corrupted links and redirect people to questionable websites. Unfortunately, it's not clear what parties this hijacker collaborates with and why content they may promote. Thus, to prevent redirects to unsafe domains, we would recommend you to remove Search.hyourweatherinfonow.com once it's installed. This dubious search site is similar to Search.weatherradarforecast.co, Search.htheweathercenter.co virus, Search.hlocalweatherradar.co virus, and many other domains that pretend to be useful tools in terms of whether forecast provision. However, such claims are bogus because Search.hyourweatherinfonow.com hijacker will not provide any useful service. In addition to browser's redirects, it can also display loads of ads among search results. The most dangerous of such ads are those promoting software or asking to install updates. Clicking on such content can lead to the installation of other malware. Careful free software installation is one of the precautionary measures that has always be taken into account when trying to prevent the installation of PUPs (adware and browser hijacker). To monetize the free service, freeware developers distribute additional installers (add-ons, plug-ins, toolbars). To prevent rejection of those unwanted attachments, the distributors usually hide them under Quick or Basic installation. That's why it's a must to select and install freeware in a conscientious manner. In some of the cases, people come across domains that offer to install PUPs directly. However, before doing so, you should initiate small research about that program, actually any program, on the Internet to check whether it's not marked as insecure. Last, but not least, to keep your PC PUP-free, avoid clicking on doubtful content dispersed on third-party websites. Be careful with prompts to install browser or software updates because adware or hijacker may hide behind the installer. There are two ways to remove Search.hyourweatherinfonow.com hijacker. You can either install Reimage and scan the system with it or follow the removal guide that is provided at the end of this post. Here, look for Search.hyourweatherinfonow.com or any other recently installed suspicious programs. Wait until you see Applications folder and look for Search.hyourweatherinfonow.com or any other suspicious programs on it. Now right click on every of such entries and select Move to Trash. When in the new window, check Delete personal settings and select Reset again to complete Search.hyourweatherinfonow.com removal. Once these steps are finished, Search.hyourweatherinfonow.com should be removed from your Microsoft Edge browser. Here, select Search.hyourweatherinfonow.com and other questionable plugins. Click Remove to delete these entries. Now you will see Reset Firefox to its default state message with Reset Firefox button. 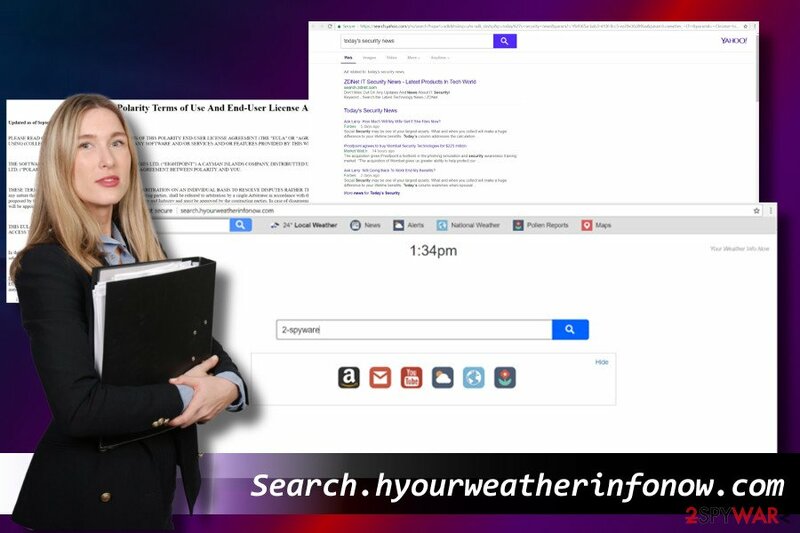 Click this button for several times and complete Search.hyourweatherinfonow.com removal. Here, select Search.hyourweatherinfonow.com and other malicious plugins and select trash icon to delete these entries. Click Reset to confirm this action and complete Search.hyourweatherinfonow.com removal. Here, select Extensions and look for Search.hyourweatherinfonow.com or other suspicious entries. Click on the Uninstall button to get rid each of them. Here, look at the Homepage field. If it was altered by Search.hyourweatherinfonow.com, remove unwanted link and enter the one that you want to use for your searches. Remember to include the "http://" before typing in the address of the page. Now you will see a detailed dialog window filled with reset options. All of those options are usually checked, but you can specify which of them you want to reset. Click the Reset button to complete Search.hyourweatherinfonow.com removal process. ^ Gabriel E. Hall. How to remove a browser hijacker?. 2-Spyware. The highest-quality information about malware and general security. ^ Michael Moore. Yahoo Mail SCAM - if you get this email, do NOT click on it. Express. Online magazine. ^ David Bisson. 3 Malware Trends to Watch Out for in 2018. Trip Wire. News, trends, and insights. This entry was posted on 2018-02-07 at 06:53 and is filed under Stealing programs, Viruses. You can quickly scan the QR code with your mobile device and have Search.hyourweatherinfonow.com manual removal instructions right in your pocket. How did you remove Search.hyourweatherinfonow.com?